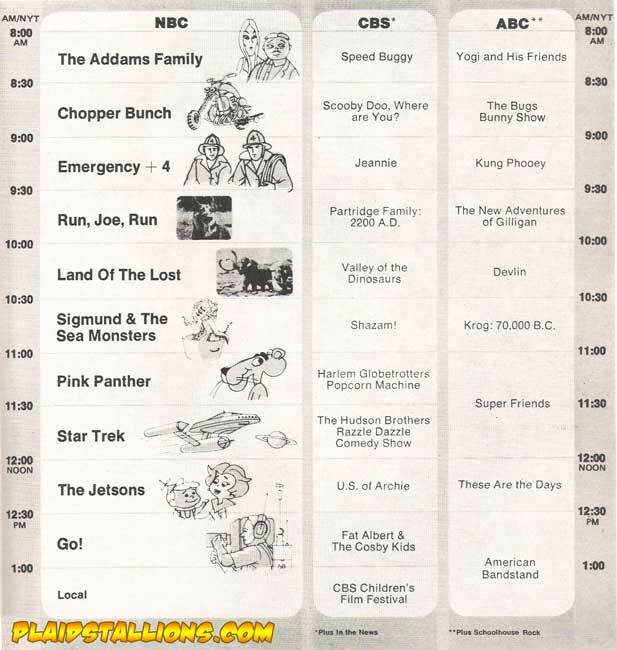 One of the things that made going back to the school in the fall more tolerable growing up was the promise of a new fall schedule of cartoons on Saturday mornings on the Big 3 networks. 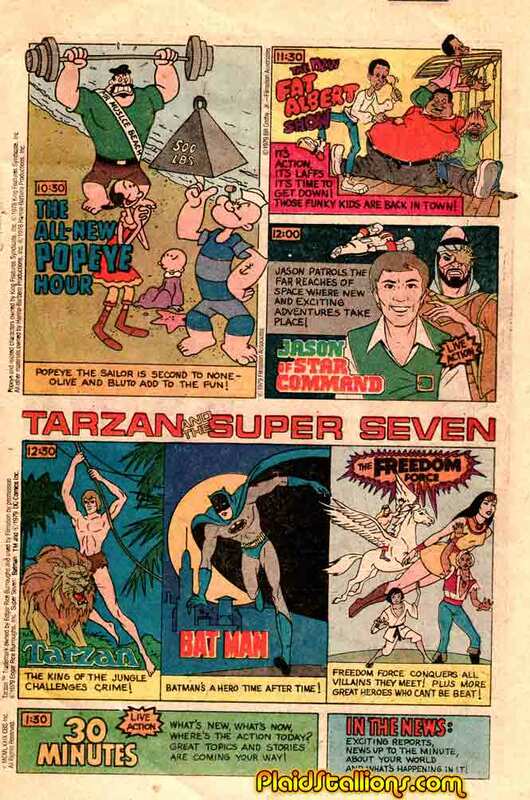 Oh man, 1974 saw the dawn of Shazam! and I was forever hooked on the adventures of Captain Marvel. Judging by this schedule, I was mainly a CBS kid which is testament to their programming as our CBS station came in "ghosted" as a kid, meaning you could see another channel through it. We put up with that for 20 years! As a kid I think I would have watched the Harlem Globetrotters read the dictionary, no idea why but I enjoyed them. I aslo have nothing but love for the "Hudson Brothers Razzle Dazzle" show but have decided to never watch it as an adult for fear of bursting that bubble somehow. 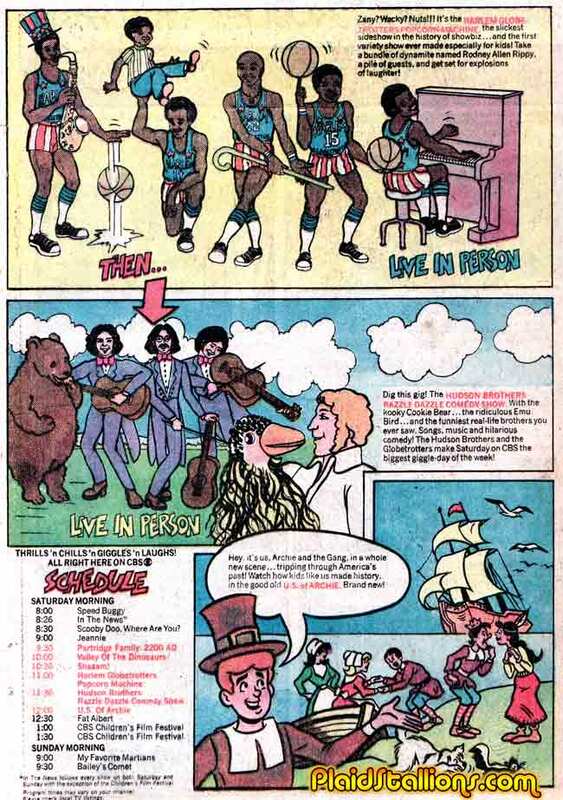 The US of Archie series is a very fuzzy memory. 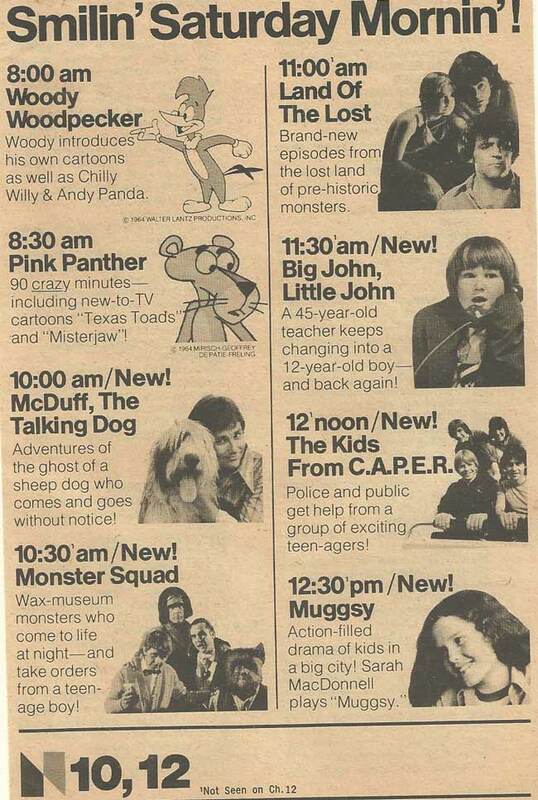 This is the fall 1974 Saturday Morning Cartoon schedule, it totally explains to me why I never saw stuff like "Emergency + 4" and "GO!" as a kid. My lame (but larger than me at the time) sister used to force me to watch "Run, Joe Run!" every week as well. 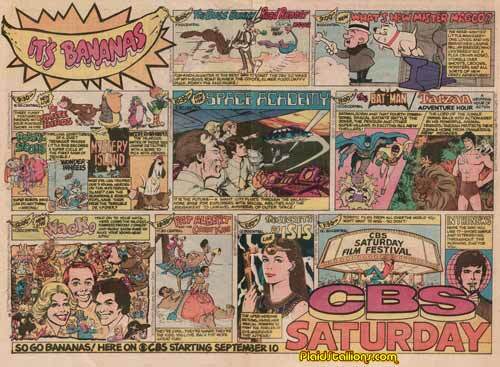 Another win for CBS in my house in 76, I was almost glued there from 9:30 to 11:30, I'd flick channels to NBC to catch "Monster Squad" and "Land of the Lost". 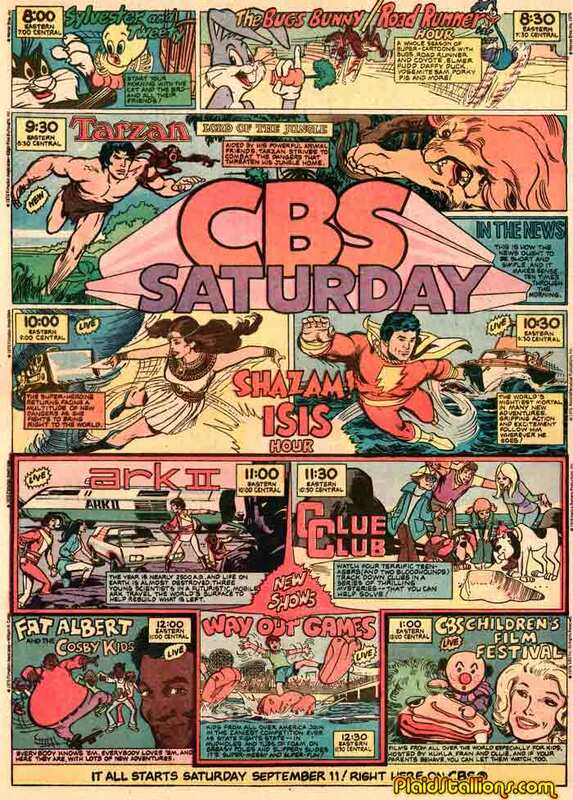 As I mentioned above, CBS had me until I'd watch Land of the Lost and Monster Squad, which had a bit of an impact on me No wonder it lost however, it was up against freaking Shazam! This 1977 schedule is pretty big so you can click on it for an improved view. 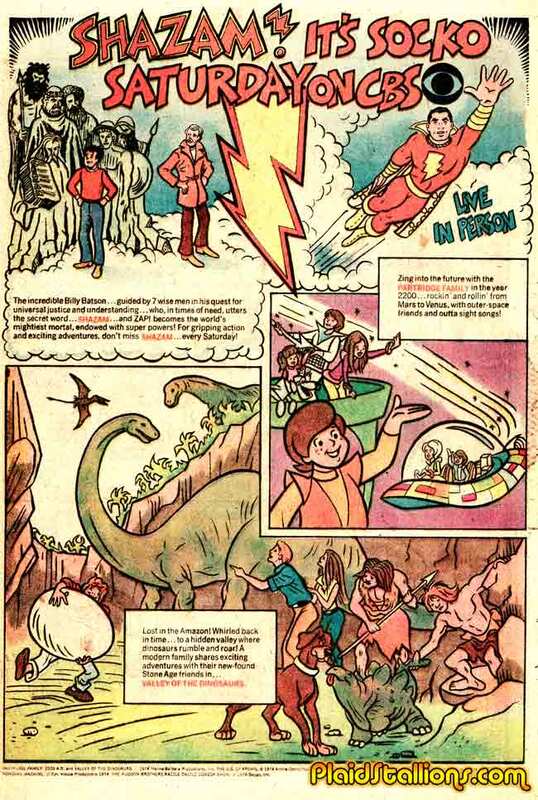 I remember being pretty PO'd at the lack of Shazam, Skatebirds and Space Academy didn't quite fill the void but they were ok, I have absolutely no memory of wacko. 1979, the dawn of Scrappy Doo! 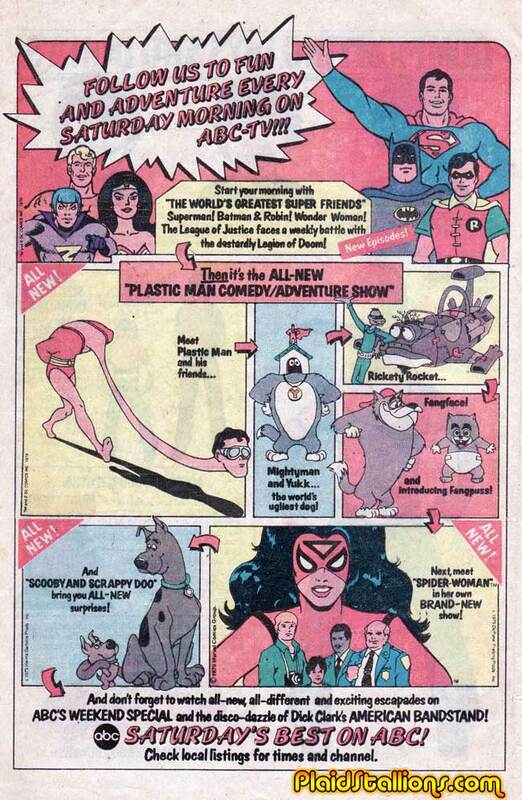 I must admit I really dug the Ruby Spears Plasticman cartoon. My local ABC affiliate (WKBW) decided not to carry Spider-Woman for some unexplained reason, years later when I tracked down bootleg VHS copies, I realized why. 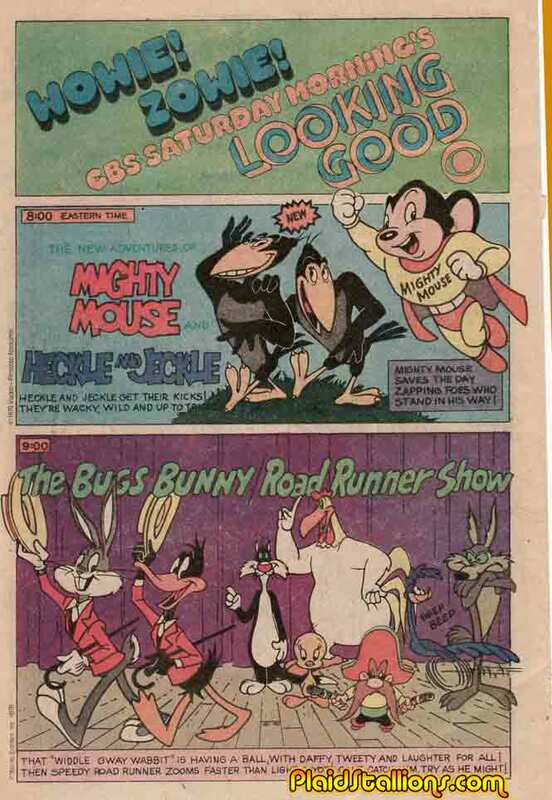 It was maddening every morning to see promos for a show only to have Woody Woodpecker show up in it's place. Like any nine year old would, I checked every week. I loved the 1980 version of Mighty Mouse, another bubble I don't need burst..
Jason of Star Command is still awesome, if you disagree with me, I will fight you.